With increasing industrialisation, metal pollution has become a new emerging environmental problem in many estuaries in China. Our understanding of the scale of metal pollution as well as the impact on estuarine ecosystem is still limited, largely due to the lack of recognition of persistence of metal pollution. 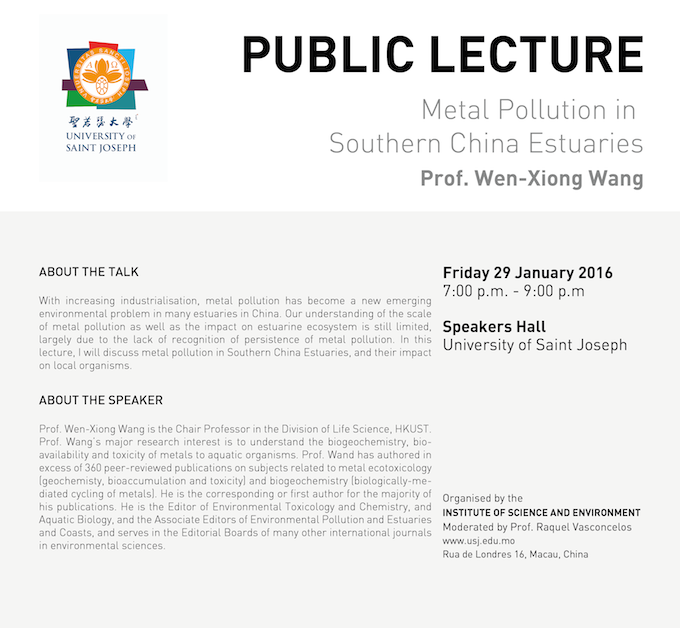 In this lecture, I will discuss metal pollution in Southern China Estuaries, and their impact on local organisms. Prof. Wen-Xiong Wang is the Chair Professor in the Division of Life Science, HKUST. Prof. Wang’s major research interest is to understand the biogeochemistry, bioavailability and toxicity of metals to aquatic organisms. Prof. Wang has authored in excess of 360 peer-reviewed publications on subjects related to metal ecotoxicology (geochemistry, bioaccumulation and toxicity) and biogeochemistry (biologically-mediated cycling of metals). He is the corresponding or first author for the majority of his publications. He is the Editor of Environmental Toxicology and Chemistry, and Aquatic Biology, and the Associate Editors of Environmental Pollution and Estuaries and Coasts, and serves in the Editorial Boards of many other international journals in environmental sciences. His work is widely cited, with a current H-index of 46. He received the prestigious Overseas Distinguished Young Scientist Award from the Chinese National Science Foundation in 2002, the Biwako Prize for Ecology in Japan for his work on metals in aquatic systems, and the first Prize in Natural Science (as a sole PI) from the Ministry of Education in China for his work on the trophic transfer of metals.